1. Erwacht, König Waldemars Mannen wert! … Just from the point of view of Gurrelieder’s mammoth orchestra and its huge choral forces such an undertaking would simply be impossible nowadays. No orchestra would or could commission a work of such length (nearly two hours in duration), combined with such an immense orchestration: eight flutes (four flutes, four piccolos, as compared to the usual three flutes), five oboes (including two English horns), seven clarinets (including two E flat clarinets and two bass clarinets), five bassoons (including two contra bassoons), ten horns (four of them doubling on Wagner tuben), six trumpets, seven trombones, tuba, celesta, four harps, innumerable percussion, and —to balance such an enormous wind band — seventy-five strings. Musicians, of course, were not paid very much in Schönberg’s time. A sardonic mind might suppose that Schönberg was just haughtily defying all conventional performance norms, all practicality. What actually motivated Schönberg to employ such expanded forces, particularly in the woodwinds and brass, was his strong desire to cast his beloved five-, six-, and seven-part chromatic harmonies (chords) in each and every possible timbral grouping or section. 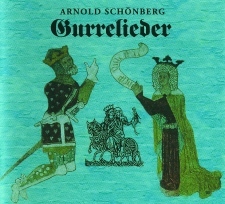 Schönberg composed Gurrelieder in a white heat of inspiration in a little over two months, between the sextet Verklärte Nacht (Transfigured Night), 1899, and the symphonic poem Pelleas und Mélisande, Op. 5, 1901. Beginning work in Vienna in early March 1900, Schönberg had Part I and II and much of Part III completed in short score by late spring, along with much of the orchestration. At that point pressing financial needs forced him to abandon work on Gurrelieder, and to take on bread and butter work orchestrating operettas of other composers — some six thousand manuscript pages in all, we are told. In March 1901 he was finally able to finish composing Part III, but then, again, more operetta arranging intervened, and it was not until much later, in August of that year, that Schönberg could finish the instrumentation of Gurrelieder and the writing out of the final full score. In the meantime, while Schönberg had also been composing Pelleas and Mélisande (between mid-1902 and mid-1903), he was offered the position of Kapellmeister at an artists’ cabaret in Berlin named Überbrettl, where he would be in charge of arranging all dance and staged numbers. In the end he was unable to get back to the full instrumentation of Gurrelieder until seven years later, in 1910 (back in Vienna), not putting the final touches on the entire work until early 1912. It is a wonder, in view of the multiple interruptions, stretched out over so many years, plaguing the creation of this work, that Gurrelieder is so perfect in its form and continuity — essentially Lied forms linked together by orchestral interludes — and in its remarkable inner logic, its deep and broad Mississippi-like flow. One might readily assume the opposite: that the scoring, perhaps even some of the actual musical substance, and the work’s consistency of form and style, had been adversely affected by the delays — especially in relation to the last three-quarters of Part III. The text for Gurrelieder was by Jens Peter Jacobsen (1847-1885), after Hans Christian Andersen and Soren Kierkegaard the most renowned mid-nineteenth century Danish author, and very popular in Germany. Jacobsen’s poem is a recounting of a medieval legend about the love of a Danish king, Waldemar, for the young Tovelille (Little Dove) — Tove in Schönberg’s work — and the murder of Tove by the jealous Queen Helwig.